Fashion’s best catalyst for sustainability and friendship pops up in Los Angeles. Walking into Ostrich Farm, a new-ish restaurant in Los Angeles’ Echo Park neighborhood one November afternoon, you’d have thought that you’d stumbled into someone’s private dinner party—if that someone had an incredible eye for hand-dyed textiles. Women, decked in deep hued, double-cloth fabrics, sipped from hi-ball glasses filled with mint-laced cocktails. All were in intense conversation. The creative guests, the eclectic vibe, and the ambience were, frankly, predictable. After all, the women behind Ace & Jig, the Portland-based brand renowned as much for its timeless woven textiles as its cult following on Instagram (look up #friendsofaceandjig if you’re so inclined), were hosting. It certainly wasn’t the first time partners Cary Vaughn and Jenna Wilson had served as catalysts to pull women together. But this was Ace & Jig’s first—official anyway—Women in Textiles gathering, and the celebratory air was palpable. Decked in bright Ace & Jig dresses and one quirky denim jacket with rhinestone pineapples and the word “Aloha” scrawled across the back (Wilson), the duo might be the last people you’d expect to serve as professional matchmakers. But as Wilson escorted me around the room, introducing me to their guests in quick succession—a VIP list of L.A. textile designers and artists from Tanya Aguiniga to Lily and Hopie Stockman of Block Shop Textiles to Niki Livingston of Lookout & Wonderland—it was clear they’d learned to connect their industry according to their own rules. Some women knew each other, but many of them were meeting for the first time, clinking glasses in solidarity. Others mused on potential collaborations. With a few artisanal cocktails and a good communal meal coming, Wilson and Vaughn were here to nudge Los Angeles’ disparate textile artists and makers into a tight-knit women’s club. And when I caught up with them by phone the next week, it seems they’d succeeded at just that. What specifically inspired you to start Ace & Jig together? JENNA WILSON: Well, we were working at companies that focused more on fast fashion and churning out product, and it didn’t feel right anymore. After the birth of our first children—their initials are Ace and Jig, actually—we said: “We want to make our own textiles, and we want them to be unique and really meaningful to us.” That’s when we decided on yarn-dye textiles. CARY VAUGHN: We got some pushback in the beginning because this was in 2009, and back then, no one was doing that. It was this sort of revolutionary thing that we were focused on our process and product. But I think people really related to that. How do you think the industry has evolved since you started 7 years ago? JW: I think now there are more people focusing succinctly on one thing, whether it’s indigo dying or whatever it is. It’s helped rejuvenate these crafts and maker movements that might otherwise have been neglected. And I think there’s more appreciation of process. People care about how things are made, and they also care that they’re made in a way that’s ethical. That brings up a good point. You have this incredible, dedicated community—your Ace and Jig community hashtag is incredibly active—and I saw the Wall Street Journal recently listed you as part of their Cult Closet. What do you think makes Ace & Jig resonate so much with women? JW: Oh, gosh. You know, you’re absolutely right to use the word “resonate” because I do think that’s a common thread between our fans and the people who love our brand. They feel emotionally connected with the textiles and the clothing. CV: Agreed. I think there are multiple answers to this question, but that’s definitely number one. And it’s something that’s different for each person because you have that feeling, whatever that feeling is, when you see and touch and wear that fabric. So it’s nostalgia for the craft for some but maybe it’s another feeling for others. You want clothes that make you feel good. Right. There seems to be really a life to your items–on Instagram you see these photos of people and their kids in Ace & Jig or even a bandana on their dog. The clothes really become part of the lifestyle for them, which is incredible. JW: Exactly. It’s functional, but it’s also soft and easy to care for and just...real. It’s all meant to be stuff that you can throw in a suitcase and, when you get there, you just whip it out. It’s stuff that I think both Cary and I just wanted to be wearing and still want to be wearing all the time. So we’re lucky enough that other women feel the same. CV: We have women in their young twenties, we have people in their sixties, so how they perceive it and like it is different for all of them, but it’s nice to have such a wide array of women loving it. What gave you the idea for your Women in Textiles evening? JW: We’d already been informally pulling people together in New York and in Portland. 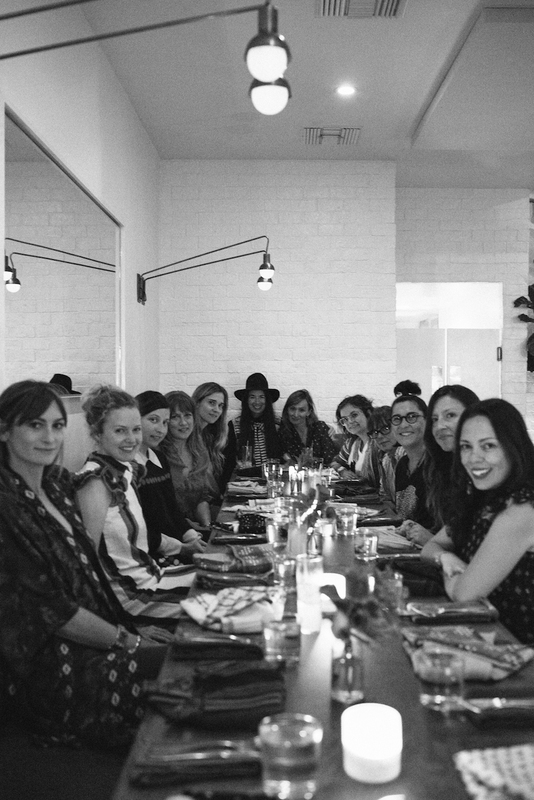 But L.A. has such a rich community of textile-based women, it felt like a dream for us to to do it here.